A recently returned World Council of Churches Ecumenical Accompanier will tell of her experience in the West Bank at a public Meeting in the Priory Centre at 7pm on FEBRUARY 4TH. Ecumenical Accompaniers monitor and report violations of human rights and international humanitarian law and offer protection through nonviolent presence. EAs stand at checkpoints within the West Bank, and at gates of separation barrier to try to reduce the abuse of Palestinian civilians and help them gain access to their land, jobs, education or medical facilities. Our stitching ladies have been busy getting ready for the 600th Anniversary celebrations. Their work includes an Archer, a Battle Banner and Glwaldys ap Thomas. 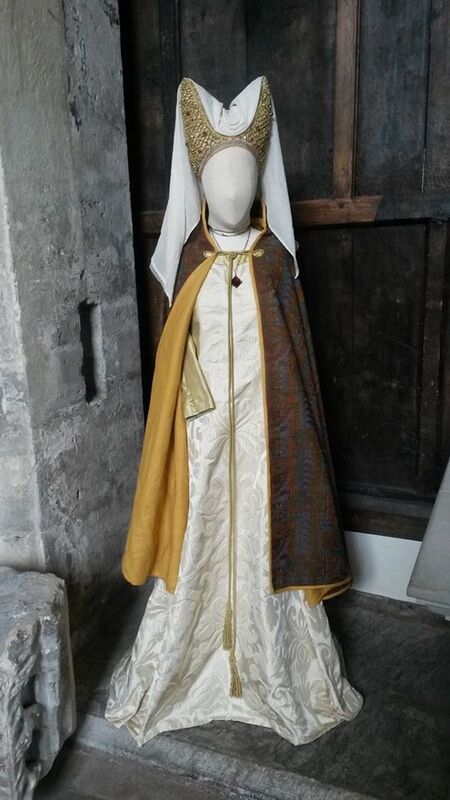 They have made a replica of Gwladys’ dress as depicted on her tomb which she shares with her second husband William, who fought at Agincourt. Gwladys’ father (Davy Gam) and first husband were killed at the battle. The St Mary’s Priory Development Trust Learning service will be part of the Anniversary Medieval Family Day at Abergavenny Castle at the beginning of June.